Pencil on paper, 8" x 11"
$65 plus $6 shipping in U.S. I've just returned from the mural project in Missouri and will post more about it soon. Meanwhile, here's another in the "White Shore" series of drawings. i haven't been able to visit so often Don but love this new series of shells! 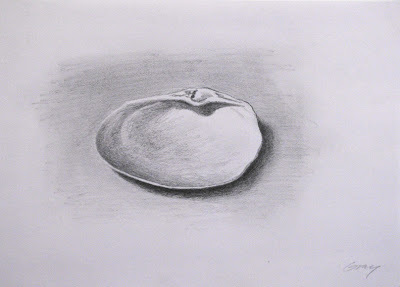 Your shell drawings are just lovely! Rahina, thanks for checking in and for the encouragement! Very kind of you, Linda--thanks!